In addition to Leigh Janiak, Her Smell director Alex Ross Perry has signed on to helm one of three Fear Street films currently in development at 20th Century Fox. Additionally, Production Weekly (via Bloody-Disgusting) has the official synopses for all three projects. FEAR STREET 1: In 1994, in the aftermath of a brutal tragedy in Shadyside, Ohio, a group of teens discover that a series of horrifying events that have plagued their town over many years might not be random, and that they may be the next victims. FEAR STREET 2: In 1978, Camp Nightwing is divided by the campers and counselors who hail from the of prosperous town of Sunnyvale and the campers and maintenance staffers from the downtrodden town of Shadyside, but when horrors from their towns shared history come alive, they must band together to solve a terrifying mystery before it’s too late. FEAR STREET 3: In 1666, a colonial town is gripped by a hysterical witch-hunt that has deadly consequences for centuries to come, and it’s up to teenagers in 1994 to try and finally put an end to their town’s curse, before it’s too late. According to The Playlist, two new Studio Ghibli projects are currently in development - one directed by Hayao Miyazaki and the other by his son, Goro Miyazaki. Patty Jenkins stated she has “clear plans” for a third Wonder Woman movie in a new interview with Vanity Fair. Discussing Film reports the sequel to Space Jam begins filming June 17, 2019 in California. Coming Soon sat down with Mads Mikkelsen and director Jonas Åkerlund to discuss Polar. Alita is burdened by dark thoughts in the latest clip. Deadline reports a Resident Evil television series “that will explore the dark inner workings of the Umbrella Corporation and the new world order caused by the outbreak of the T-virus” is now in development at Netflix. 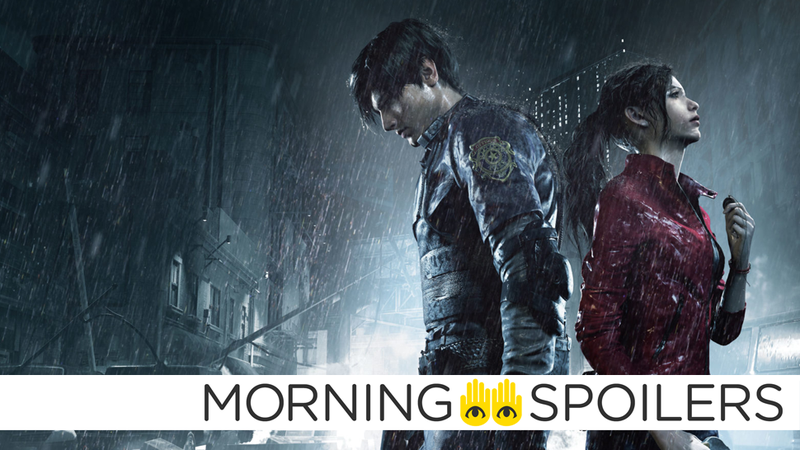 According to Deadline, German production and distribution company Constantin Film, who are behind the Resident Evil movie franchise, will help produce the show, and the series itself will “ deepen the existing mythology” of the series—whether that means it’s set in the world of the films or is a reboot exploring the mythos of the game series remains to be seen. Speaking with Entertainment Weekly, showrunner Angela Kang revealed a “The Fair”—a gathering of survivor communities in the comics after their flash-forward timeskip that eventually sees Rick (who’s still around in the books at that point, unlike the show!) and the survivors cross paths with the Whisperers—will feature in the second half of the show’s ninth season. Relatedly, a new trailer teasing the Whisperers’ arrival has been posted to The Walking Dead’s official Twitter. KryptonSite has our first look at Jessica Meraz as Menagerie in her self-titled, debut episode, “Menagerie.” More at the link. A new trailer shows us what to expect “this semester” on Deadly Class. Finally, Gina Rodriguez talks growing up in ‘90s in a new featurette hyping the new Carmen Sandiego animated series.